On your wedding day you’ll simply want to bask in the glory of married life, so make sure that you put in the work to create the celebration of your dreams. There are a lot of different parts to a reception, and here are some important factors for choosing the perfect reception venue. You’ll want to ensure that your reception venue has enough room to accommodate all your guests comfortably as well as the activities you’ve planned for your wedding reception. After all, the maximum capacity of a building is not necessarily what will be ideal for your guests. Ask how many can comfortably fit in the space, and keep your guest list in mind. It’s a good idea to have your guest list already finalized by the time you’re ready to book a venue, so that you’re not forced to try to squeeze in last-minute additions. Another aspect to consider is the parking situation. You should make sure that your guests will have access to parking and that they won’t have to trek too far after a night of dancing. If there isn’t a lot of parking, or if the venue is a long way away from the hotel or ceremony space, consider using a shuttle service. Also, if your reception site is separate from your ceremony location, you may want to provide directions for your guests. As with the ceremony space, you’ll need to consider the weather forecast. If you’re having an outdoor reception, rent a wedding tent to ensure protection from any rogue rainstorms. It may be wise to see if your reception site has an indoor space available. It may seem obvious, but try to match your venue to your wedding vision. If you’re having a modern city wedding, look at art galleries or museums. If you’re imagining an intimate and natural gathering, consider backyards and gardens. As you look around, try to envision the way the space will be used. Your guests will need places to eat, mingle, and dance, and your reception venue should have a flow to accommodate this. In addition to places for guests to dine and dance, consider the space and layout needed for the cake, gifts, dance floor, photo booth, etc. Try to think about the extras you’ll need to create your ideal reception. Things like table linens, silverware, and chairs can be included with some reception sites, but you may find that renting is necessary or simply fits your vision better. 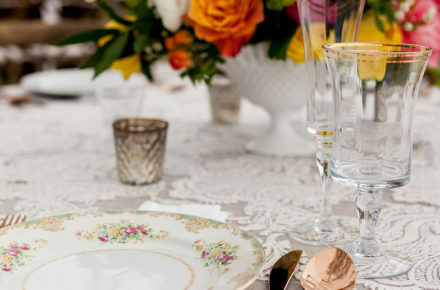 Remember that the included items are usually basic, and if your theme is more unique, it may be less costly to go with a venue where all you have to do is rent and bring in your own utilities. Learn about the restrictions and rules associated with the venue. 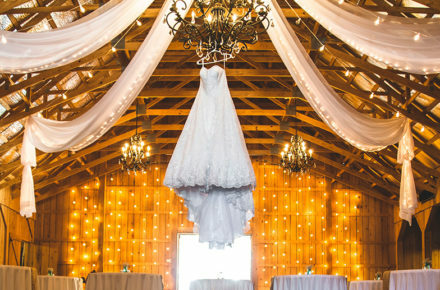 If you absolutely love the venue, knowing these restrictions will help you incorporate them into your vision for your day. 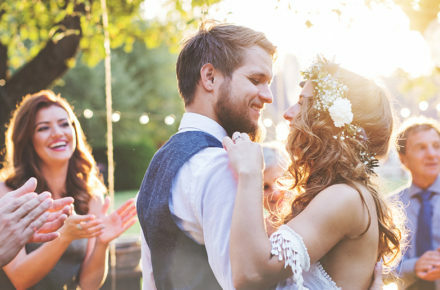 For example, if the reception must end at 9 p.m. sharp because of noise restrictions but you want to dance the night away, consider having an after-party elsewhere to keep the festivities going. Things like liquor licenses and restrooms (usually one stall per 25 guests is recommended) should also be considered before you make your final decision. What’s First on Your Wedding Planning To-Do List?